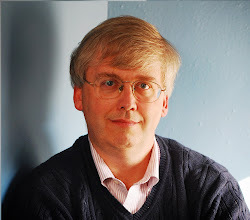 Part of the mythology of US higher education is that it offers a meritocracy, along with a lot of second chances, so that smart and hard-working students of all background have a genuine chance to succeed--no matter their family income. But the data certainly seems to suggest that family income has a lot to do with whether a student will attend college in the first place, and even more to do with whether a student will obtain a four-year college degree. 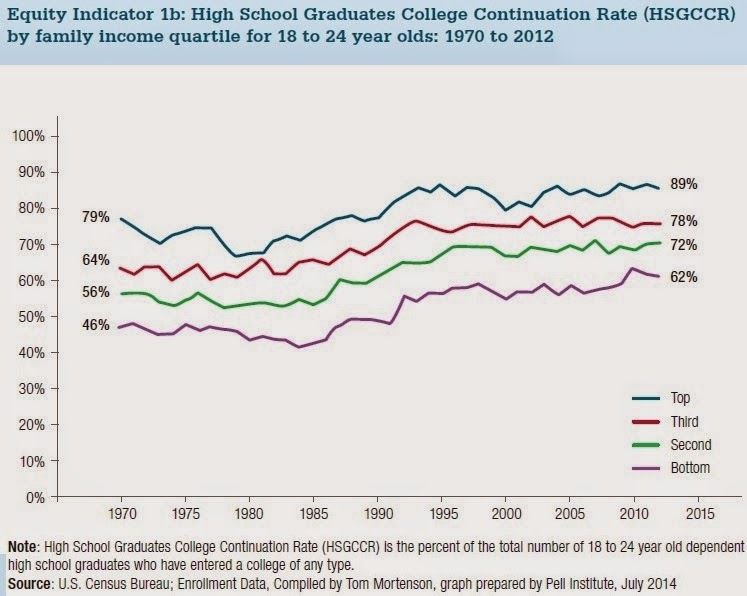 Margaret Cahalan and Laura Perna provide an overview of the evidence in "2015 Indicators of Higher Education Equity in the United States: 45 Year Trend Report," published by the Pell Institute for the Study of Opportunity in Higher Education and the and University of Pennsylvania Alliance for Higher Education and Democracy (PennAHEAD). As a starting point, consider what share of high school graduates, age 18-24, are enrolled in college of any type (two-year or four year, public, private, or for-profit). The gap between the top quarter of the income distribution and the bottom quarter has narrowed a bit in the last 45 years (from 33 percentage points to 27 percentage points), but it remains substantial. Of course, if one took into account the fact that students whose families are in the bottom quarter of the income distribution are less likely to become high school graduates, the gap would be wider still. Given this background, it's not surprising that that those from the top quarter of the income distribution are more likely to have a bachelor's degree by age 24. 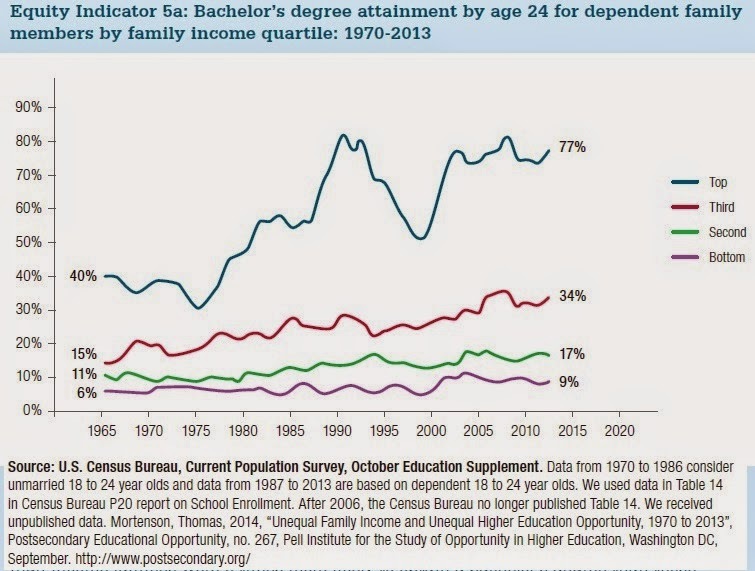 Indeed, the share of those completing a bachelor's degree by age 24 has risen substantially for students from families in the top quarter of the income distribution, and barely budged for those in the bottom two quarters. The report offers a range of evidence that the affordability of college is a bigger problem for students from low-income families even after taking financial aid into account. Students from low-income families take out more debt, and are more likely to attend for-profit colleges. 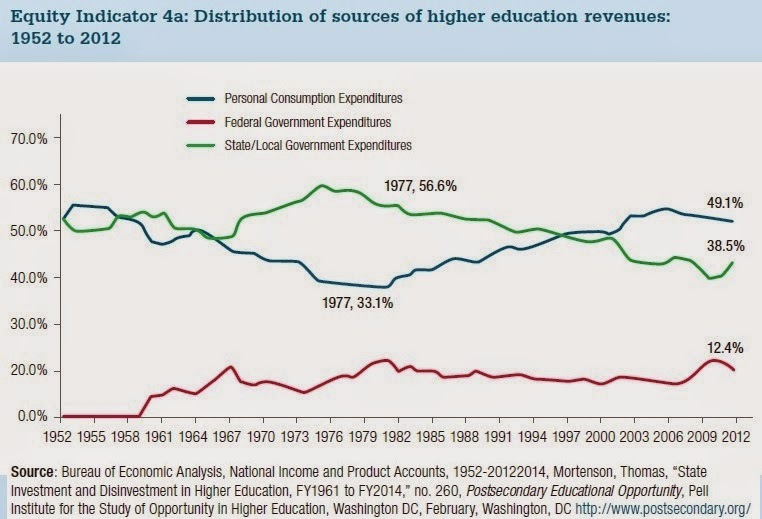 Indeed, a general pattern for higher education a whole is that even as the cost of attending has risen, the share of the cost paid by households, rather than by the state or federal government, has been rising. The effects of these patterns on inequality of incomes in the United States are clearcut: higher income families are better able to provide financial and other kinds of support for their children, both as they grow up, and when it comes time to attend college, and when it comes time to find a job after college. 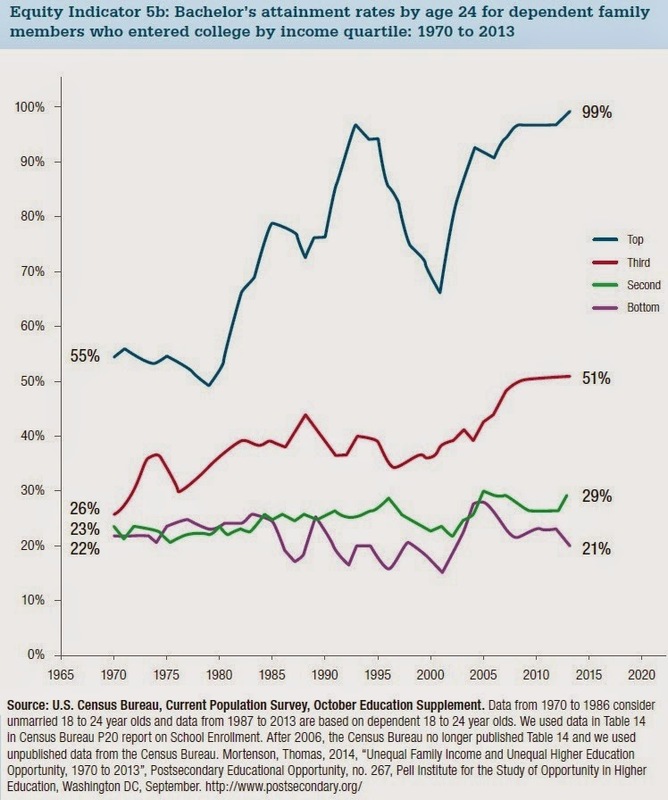 In this way, higher education has become a central part part of the process by which high-income families can seek to assure that their children are more likely to have high incomes, too. Moreover, changes in earnings associated with different levels of education – that is, human capital – have played an outsized role in raising inequality among the bottom 99 percent of Americans. If the return to education increases over time, and higher-income parents are more prone to invest in the education of their children than lower-income parents – or if talents are inherited from one generation to the next – then the gap between children of higher- and lower-income families would be expected to grow with time. Furthermore, if social networking and family connections also have an important impact on outcomes in the job market, and those connections are transmitted across generations, one would expect the ... effect to be even stronger. There are, indeed, signs that the rise in income inequality in the United States since the late 1970s has been undermining equality of opportunity. For example, the gap in participation in extracurricular activities between children of advantaged and disadvantaged parents has grown since the 1980s, as has the gap in parental spending on educational enrichment activities. Furthermore, the gap in educational attainment between children born to high- and low-income parents has widened. The rising gap in opportunities between children of low- and high-income families does not bode well for the future.